Stairway Foundation is a childcare organisation located in Puerto Galera, Philippines. It was established in 1990 as an alternative program for the most marginalised and endangered street children in the Philippines, and has since evolved into an inspirational Learning & Resource Centre addressing societal problems at many levels. Children on the streets suffer a myriad of consequences through abandonment and neglect. Aside from being highly at-risk for sexual abuse, they are malnourished and lack proper hygiene – resulting in TB infection and many other medical problems. These children don’t get the education that they need, and often begin sniffing drugs at an early age to forget the cruel reality of life on the streets. To address this heartbreaking situation, Stairway Foundation is an advocate for the protection of these children, and against child sexual abuse worldwide. 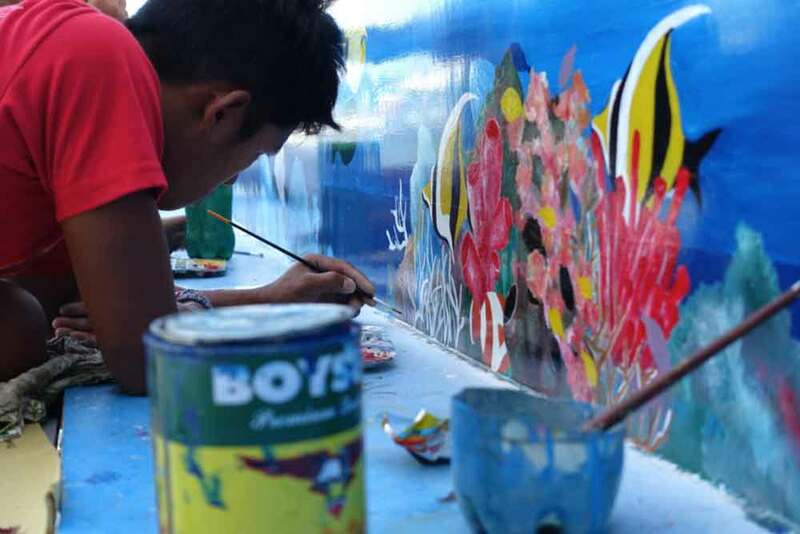 They also take in 15 street children into their temporary family home programme every year, offering them a unique rehabilitation experience in the beautiful surroundings of Puerto Galera Bay. These children receive a general education as well as learning about Children’s rights and Child Protection Policies. They also learn through creative activities such as art, theatre, music, youth exchange camps, educational trips, and handcraft activities. The Marshall Foundation recently funded the construction of a wood and metal workshop for the children of the Puerta Galera Bay project. As the indigenous people suffer from discrimination and poverty, Stairway Foundation aims to empower these communities by strengthening their self-esteem and capabilities through education. With support of the Marshall Foundation, a breakfast and lunch feeding programme was introduced at the local indigenous elementary school, and this resulted in a 400% increase in attendance. Through Stairway Foundation’s EACY project, children from the local community now also learn to appreciate and safeguard Mother Nature. The Marshall Foundation supported the construction of a boat named “Berge Apo SAS” which, since May 2014, serves as a Sea Adventure School. This boat takes children to different sites at the beautiful Puerto Galera Bay where they learn first-hand about mangroves, the sea grass and coral reefs. On another day they may come to Stairway’s lab to examine collected specimens through microscopes, or to watch a documentary about Philippine’s environmental challenges, with a theatre presentation of the environmental conservation tale ‘The Lorax’ by Dr. Seuss. Feedback from the children is always fantastic, and they really seem to understand the importance of protecting nature.